Country and sponsors pay an athlete to do their best as well as speak to the press. It’s not ok to walk through the mixed zone without a word to the people who flew there to transmit any athlete’s emotions back to their fans. All the big names know this is part of the drill. Major sports are structured so every athlete has that obligation of representation, good or bad day. They swear at the opening ceremony to behave ‘…in the true spirit of sportsmanship, for the glory of sport and the honor of our teams. The mixed zone interviews are is a big part of that. No one has the right to stroll through the mixed zone with a cursory nod. Going ‘hi guys’ and walks off after the 100 backstroke just reinforces the egotistical athlete, all about his own glory. If he wants people to pay for his swimming he better learn to face the press. You fly the flag, you share with all under it. I remember at Incheon 2014 rower Saiyidah Aisyah who paid her way without a coach to compete in an nationally unsanctioned sport under the Singapore flag. She came in last. She owed no one an explanation. It seemed like no one believed in her but herself and her family. Still she met the gaggle of journalists who drove 4 hours to see her at 9 in the morning and wept in her disappointment. She’s mature enough to know her obligations in competition. She’s done so well this Olympics, I’m so proud that she’s flying our flag. I was then and I am now. 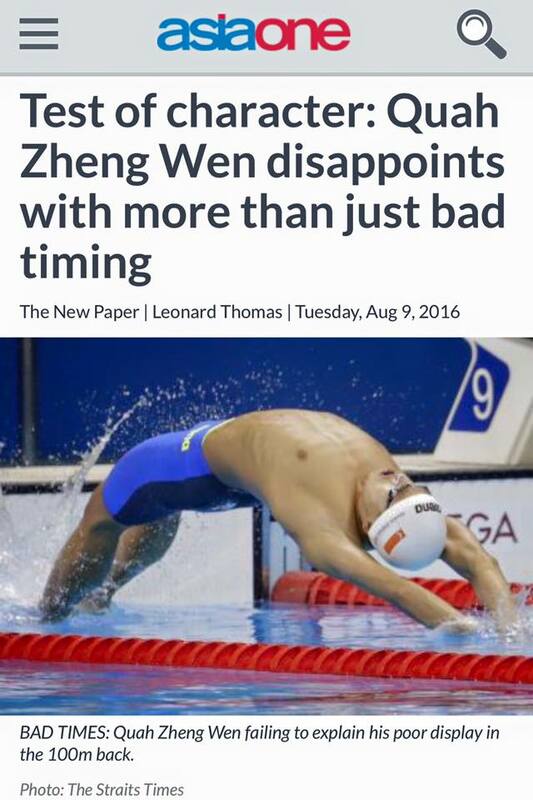 How many tens of thousands have been spent on Quah Zheng Wen and he arrogantly strolls through the mixed zone while far better swimmers explain themselves via their national media and agencies. His poor coach who was brought in from the US is left to answer for his swims. Its not football, its an individual sport, only the swimmer can answer for himself. Of course that is a huge part of the pressure. An athlete does not compete alone, at least not at the Olympics. He competes for the nation. To the likes of Joseph Nair and the idiotic Leonard Thomas with a acute sense of tyrannical self-entitlement, the International Olympics Committee had stated clearly in their Mixed Zone guidelines that athletes have to passed through the mixed zone but are not obliged at all to answer any questions nor interviewed by the press.